Author: David J. Peck, D.O. Description: By David J. Peck, D.O. 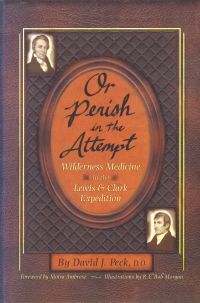 An urgent-care physician with a passion for the Lewis and Clark Expedition describes its medical aspects. The two captains had to act as doctors for their own men, Sacagawea and baby Pomp, and also treated many Indian nations met along the way. But they used the primitive medicines and theories of 1803, which often called for doing just what shouldn't be done, or what had no effect. Dr. Peck describes the trip from St. Louis to the Pacific Ocean and back, emphasizing the illnesses and accidents, and how the captains dealt with frostbite, severe cuts, appendicitis, venereal disease, pelvic inflammatory disease, mental illness, parasites, skin infections, snowblindness, gunshot wound, dislocated joints, muscle spasm, and more. Anecdotes from his own practice enrich the information he gathered from current medical publications. He also presents medical and anecdotal evidence supporting the theory that Meriwether Lewis died from suicide rather than murder. Index. 360 pages, hardback, 6"x9".